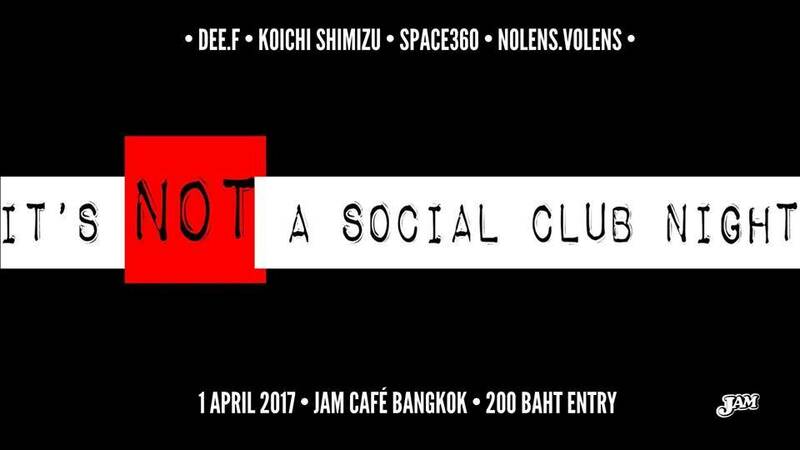 "It's NOT a social club night" is a conceptual event that plays on a witty note when punters are going to techno club with no intention of being sociable, yet open their ears out just for music. No talking, not chit-chating, just raving feet, and access to speakers' front spot. ... and live techno music. Creating art in a ‘binary-gen’ world, the artist’s multi-facet mind is at a state to observe and challenge its reasonably sane path. Often finding his sound buried with poetic yet provocative rhythms, Phu attempts to sculpt many of his conceptual sides through music. Bangkok based Japanese artist. After studying sound engineering in NYC, Shimizu moved to Bangkok for the first time in 1993. He finally decided to settle down there in 2003 and started his own record label and party called SO::ON Dry FLOWER, actively releasing albums of unique local artists and orgazing various scale concerts for artists from all over the world. Shimizu is also known as a music composer and sound designer for Thai fi lm. He has won Best Composer Award at 2009's Dubai International Film Festival and “Uncle Boonmee Who Can Recall His Past Life” which he provided sound design won Palme d”Or at 2010's Cannes Film Festival. Musical alter ego of Auttaratt Benz Photongnoppakun and he creates multiple dimensions of Electronic Music Sound and he confines to no specific genres... Best to place him in Experiment Electronic Music and IDM room. He also special lecturer in DCI Institute and Prayao University, and taught himself how to create electronic music since the age of 17.